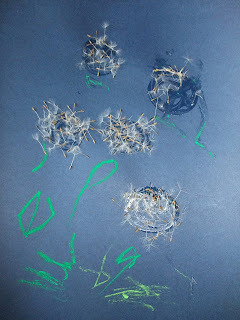 We have so many dandelions on the green outside our house we just can't keep up with them. I have sacrificed my lawn for the joy the Bean gets out of blowing the clocks. No doubt next year our lawn will be as full of dandelions as the green. But I'm trying to think of other things to do with them. Here's some pictures we did. I put the glue on and Anneli blew the clocks over the paper and stuck the petals on. 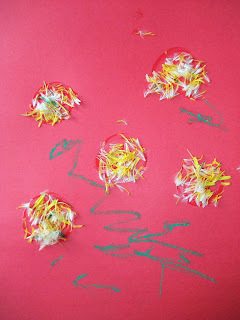 She then drew the leaves with pastel. I think they are pretty marvellous!